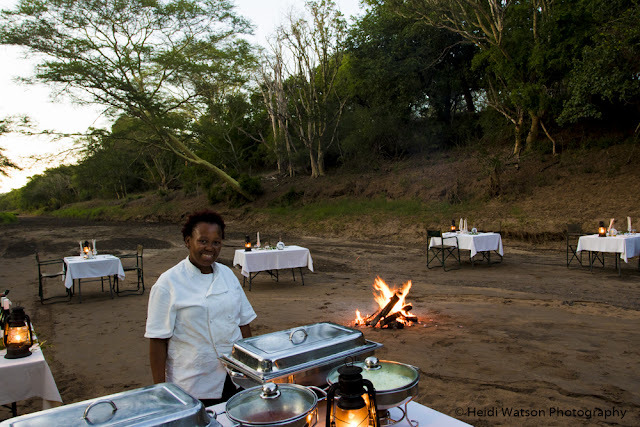 What drew you to your position at Rhino River Lodge? What drew me to RRL was change and exposure to new things and a whole new environment. I got this and more, especially with the how warm and open my bosses are. The fact that I am free to excersize my creativeness without limits. What is your favorite part of being a cook? Making people happy through my meals and seeing them smile and appreciating every meal. Which gives me great motivation. How do you get inspirations for new recipes? Mixing and combining the unusual with the usual. Braai (Boerewors, Chops and Steak) with a putu pap and tomato & onion sauce. This is by far the winner with our tourists because it shows them how we South Africans love our meat! Will you share an easy South African-inspired recipe with us? Boil washed samp and beans together for 3-4 hours until soft. In the last 30 minutes of cooking add masala, salt and pepper (to taste) and tomato and onion mix . When the boiling is finished add a handful of coriander.